The Rockport Film Review: You Can "Say Anything" But see this Classic Movie! 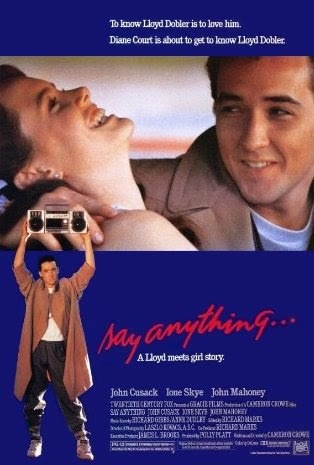 You Can "Say Anything" But see this Classic Movie! This classic 80s teen romance was the debut feature from Cameron Crowe who also wrote the script. It stars John Cusack as Lloyd Dobler, a vision of what was going to hit Seattle in the early 90s, a sort of pre-grunge era. Dobler's classic trench coat and laid back attitude set the tone for this story of surprising honesty and originality. Ione Skye co-stars as Diane Court, the school valedictorian and Lloyd's object of affection. Lili Taylor and John Mahoney also give a memorable supporting performance. Its graduation day for Lloyd and he has no set plans for his future except for maybe kickboxing. He is the ultimate underachiever who lives with his sister and nephew, his friends are mostly female, most notably the guitar playing Corey (Taylor). Conversely, Diane lives with her dad and has won a prestigious fellowship to study in England in the fall. She's had little time if any to socialize with her classmates and has few relationships beyond her father (Mahoney) who runs the nursing home where she works. Lloyd decides to call Diane after seeing her at graduation and talks to her father, he takes a message and adds it to the pile. She calls him back and she agrees to go out with him to a graduation party. Lloyd is a mixed bag of nervous excitement when he picks her up. They seem to be the perfect opposites attract couple. Lloyd is a complex character as he is smart and sympathetic, but also impulsive and directionless. He lives for the now with no regard for the future. They have a great time at the party, Diane finally gets to let go and have some fun and feel accepted with people her own age. Diane only has the summer to be with Lloyd before she leaves for England and must decide if Lloyd is worth risking her future for. Her father is obviously opposed to their relationship. Exactly how strong is their love anyway? Another interesting little distraction comes into play when the IRS comes knocking and ask to see the books for nursing home. Diane's father has always done everything he could to support his daughter even it meant breaking the law. She is put in a tough position as she is finally told the truth about her father. Going against everything she feels and looking towards the future Diane takes her fathers advice and breaks up with Lloyd. She gives him a pen wanting him to write to her. Lloyd will not let her go that easily as he puts his heart on the line to get her back, with one of the most iconic scenes in teen movie history. Across the street from her bedroom window, he hoists his boom box over his head and blasts their song Peter Gabriel's "In Your Eyes". Of course, this would only work in an 80s movie. After she learns the truth about her father she seeks out Lloyd at the gym and they get back together. Lloyd is going with Diane to England and will do what he does best, to support her and be there for her in whatever she does.